Who Are You Trying To Be Better Than? Don’t try to be better than your nemesis. Don’t try to be better than your competition. Don’t try to be better than your next-door neighbour or the person in the next cubicle. Don’t try to be better than your wife’s ex-boyfriend (or your ex-wife’s new boyfriend). Don’t try to be better than your parents expected you to be. Don’t try to be better than the very best person in your field. 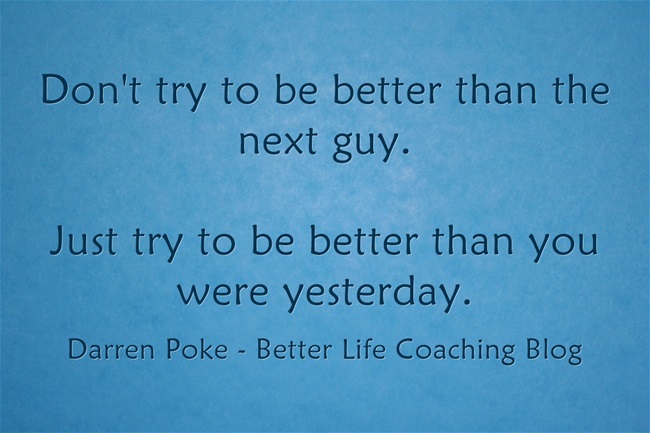 Don’t try to be better than the next guy. Just try to be better than you were yesterday. And then do that again tomorrow.